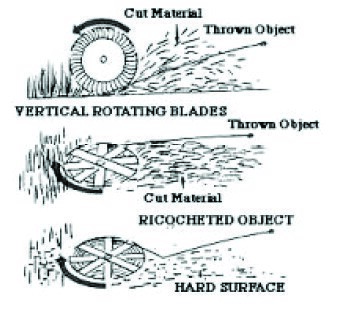 Objective: Identify hazards associated with rotary mowers and methods for reducing those hazards. Review the information below on rotary mowers, hazards, and safety tips. Demonstrate the safe use of a rotary mower. Present the demonstration in the shop or in an open field. Ask an employee who normally operates the rotary mower to assist with the session. throwing distance and direction for that blade. Never allow riders on the equipment. Remove all litter and debris from the area to be mowed. Stones, tin cans, and wire can be deadly when thrown by a mower blade. Be alert for holes and ditches; these hazards may cause the driver to lose control of the mower. Before dismounting from the tractor, always disengage the power take-off (PTO), turn off the engine, and set the brakes. When approaching the mower, make sure that the blades are not rotating. Be aware that the blades will continue to rotate for a while after the power has been shut off. Be cautious while making turns. If the rear tractor wheel of a pull-type mower catches the mower frame, it could throw the operator. The three-point hitch-mounted mower can swing outward when turning. Adding front wheel weights for balance and control and a wide setting for the rear tires enhances tractor stability and reduces the chance of a tractor overturn. Do not operate on steep slopes. Operate at a safe speed. Hazard risks increase when equipment is not well maintained. Know the proper maintenance procedures. Check machinery for loose parts and blade sharpness. Replace blades that are too dull to sharpen. Rotary mowers are equipped with runners and safety guards. To avoid excessive wear on the runners, keep the mower just high enough to avoid riding on the runner shoes. Manufacturers recommend that children not be allowed to operate a tractor equipped with a rotary mower because of the danger involved. Young workers may be able to operate a sit-down mower of less than 20 horsepower—but only on level ground and with supervision. Under federal child labor regulations, 14- and 15-year-olds may not operate power-driven machinery like rotary lawn and brush mowers. Check for debris, holes, and obstacles prior to mowing. Know the law when hiring youth to drive mowers.